Exports International, LLC is a full-service consulting firm specializing in export licensing and compliance. The licensing of exports and imports from and to the U.S. has become exceedingly complex. Anyone involved in exporting or importing goods knows this. Exports International, LLC specializes in assisting companies to negotiate the often stressful waters of modern-day exporting and importing. At EIL we can help you with all aspects of licensing (and exemptions) for exports and imports: ITAR licensing via D-Trade, Commerce Department SNAP-R licensing, ITAR/EAR training seminars, customized training, compliance manuals, remediation of problematic past practices, and much more. Ask us about building a customized export compliance training Website for your company, to aid initial and recurrent training, date/time-stamped testing, grading and certification of all your employees. Our focus is to help companies efficiently export or import while staying in compliance with U.S. export regulations. • a massive movement of export jurisdiction from the USML to the CCL. • a new approach to jurisdictional classification: Is an item on the USML, the CCL, or neither? • each revised USML category is matched by new CCL "ECCN" classifications, collectively referred to as the "600-series" . • a formal Transition Plan intended to ease rules' implementation. • a major revision to the "brokering" definition and rules. ALERT: Starting back on October 15, 2013 the first tranche of changes began with the restructuring of the export rules regarding Aircraft and Engines and their parts and components. This continued with other major updates to both the ITAR and EAR through to the present. The final rewritten ITAR and its USML, current through Jan 1, 2019, is available for download on our Exporter Tools page. 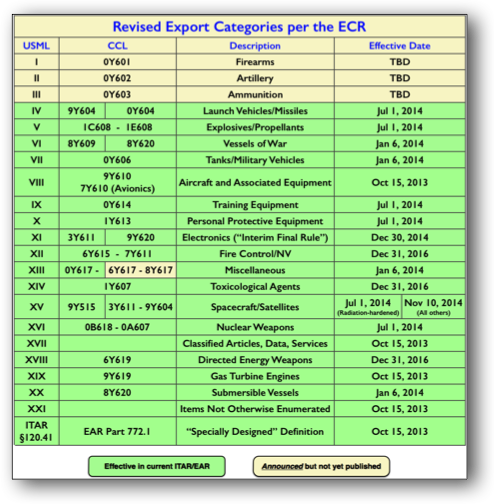 These updates to the ITAR/USML came with mirror-image changes to their EAR/CCL counterparts, and are continuing, as summarized in the table elsewhere on this page. Our latest "searchable" e-EAR is also available for download, updated through Jan 1, 2019 — including the new, expanded Russian Sanction program. We offer training in all aspects of the ECR. Many of these regulatory changes will doubtless be beneficial for you; others not so much. Contact us to discuss customized training for your company. All our export compliance training is, and always has been, fully tailored for each individual company, never a "one size fits all" public-seminar approach. Let's discuss how we can help you.